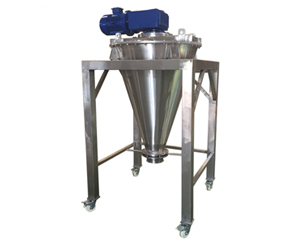 NKM RBM-V series Vertical Ribbon Mixer (or so-called Conical Ribbon Blender) is the vertical version of RBM series Ribbon Blender, and shares the same appearance with CSM series Conical Screw Mixer. RBM-V Vertical Ribbon Mixer is an efficient and versatile blending machine for batch mixing of free-flowing powders which covers a broad range of applications from chemical to pharmaceutical. 1) NKM is able to design the Vertical Ribbon Mixer to be used as a reactor, dryer or deaerator, with the additional heating jacket, vacuum system, etc. 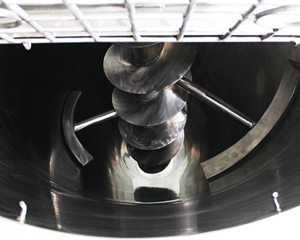 3) End products can be discharged completely without any residual in the conical container. 5) Both continuous and interrupted types of ribbon are available for different materials. 6) No minimum volume required for the Vertical Ribbon Mixer. 7) When it is required to add liquid during mixing operation, NKM offers spray nozzles on the top of the container. 8) A variety of discharge arrangements are available by manual, pneumatic or electrical operation. 9) NKM builds our mixers with contact part by carbon steel, SS304, SS316L, Titanium, Duplex stainless steel, Hastelloy and others. For abrasive materials we offer Teflon coating for the contact parts, and chromium coating for corrosive materials. Also we build mixers all by stainless steel in order to meet the high hygienic requirement. 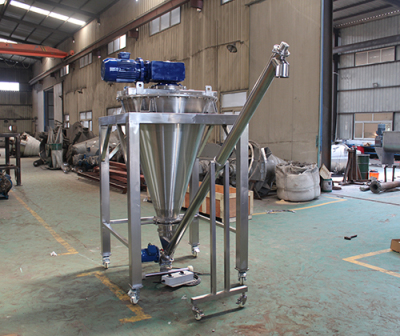 The construction of NKM RBM-V series Vertical Ribbon Mixer is very compact: it consists of a cone vessel with the drive unit on the top and discharge valve at the bottom, and a tapered ribbon mounted on the central shaft with a screw. The central screw moves the materials upward from bottom to the top, meanwhile the ribbon pushes the material from center to the side walls, where the materials then drop by gravity into the center. During this continuous operation, material particles and heat are exchanged quickly which leads to a homogeneous product.